This was from my first walk of the New Year – in fact, because of the damage done to my leg last year, it was more or less the first walk in nine months. I went up with my daughter to see what the eastern flank of Cosdon looked like, both of us testing our new Meindl boots. The boots were fantastic. I had a little rubbing on one shin after the first couple of hours, but that was all. My daughter didn’t even have that! This was the view I was looking for, though. It’s a prehistoric stone row. Oddly, it’s a triple row. Most are more commonly only two or even one. This was recorded by Worth in his monumental work, “Worth’s Dartmoor”, and appears to be little changed. The position is taking the photo from the eastern edge of the row, looking west to the burial chamber (the darker area). 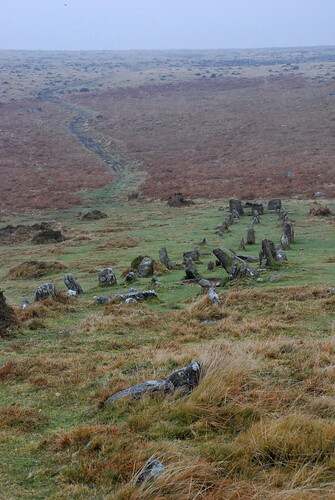 There are several of these rows on Dartmoor, and it’s thought that they were the graves of bronze-age chieftains who were buried in their chambers with the row indicating the importance of the man. Which means this guy was a pretty important fellow. Not as important as the man on Stall Moor, though. He only had a single row of rocks, but his row was 11,500 feet long – say, about two and a half miles! This entry was posted on Friday, January 4th, 2008 at 3:44 pm	and is filed under Dartmoor. You can follow any responses to this entry through the RSS 2.0 feed. Both comments and pings are currently closed.